The Port Times Record, pictured, and Village Beacon Record published this piece in print on Dec. 01, 2016. The Village Times Herald and Times of Middle Country published this piece in print on Nov. 24, 2016. 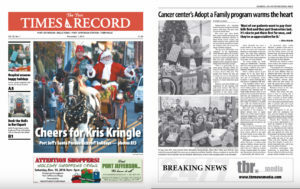 Five years ago, when Linda Bily, cancer patient advocacy and community outreach director at Stony Brook Cancer Center, and others noticed some patients did not have family members to share the holidays with, she started the Adopt a Family program. 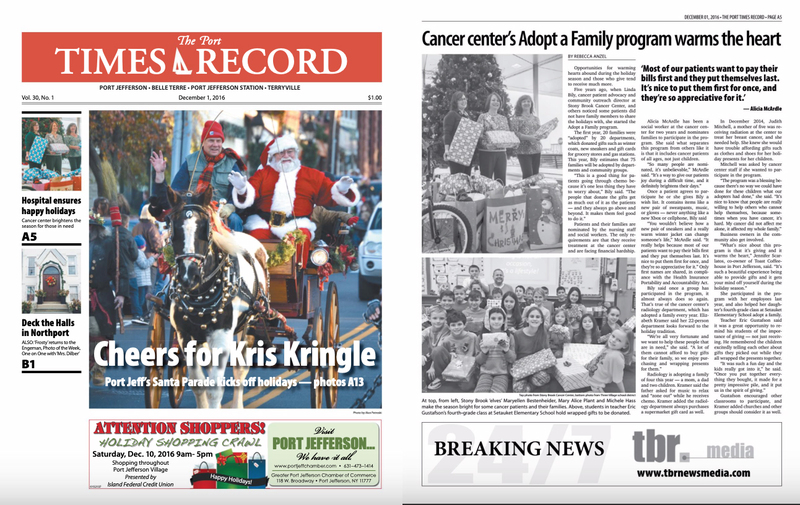 The first year, 20 families were “adopted” by 20 departments, which donated gifts such as winter coats, new sneakers and gift cards for grocery stores and gas stations. This year, Bily estimates that 75 families will be adopted by departments and community groups. Patients and their families are nominated by the nursing staff and social workers. The only requirements are that they receive treatment at the cancer center and are facing financial hardship. Alicia McArdle has been a social worker at the cancer center for two years and nominates families to participate in the program. She said what separates this program from others like it is that it includes cancer patients of all ages, not just children. 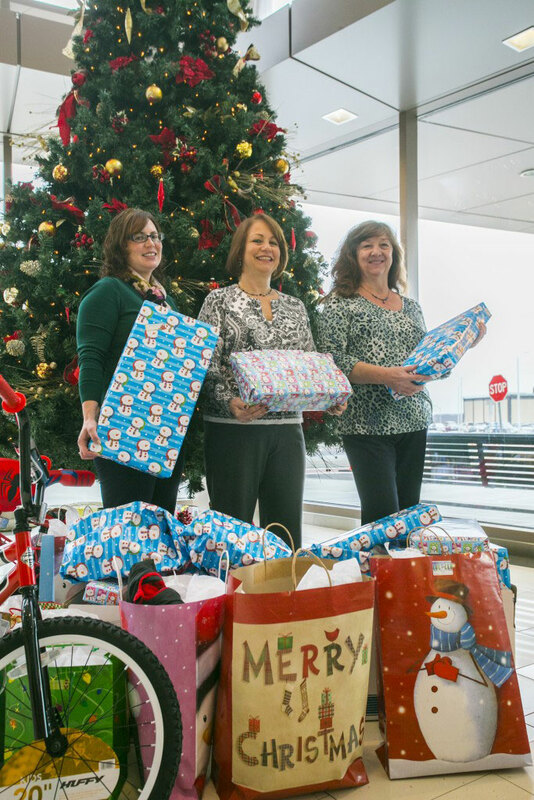 From left, Stony Brook ‘elves’ Maryellen Bestenheider, Mary Alice Plant and Michele Hass make the season bright for some cancer patients and their families. Photo from Stony Brook Cancer Center. “You wouldn’t believe how a new pair of sneakers and a really warm winter jacket can change someone’s life,” McArdle said. “It really helps because most of our patients want to pay their bills first and they put themselves last. It’s nice to put them first for once, and they’re so appreciative for it.” Only first names are shared, in compliance with the Health Insurance Portability and Accountability Act. Bily said once a group has participated in the program, it almost always does so again. That’s true of the cancer center’s radiology department, which has adopted a family every year. Elizabeth Kramer said her 22-person department looks forward to the holiday tradition. Radiology is adopting a family of four this year — a mom, a dad and two children. Kramer said the father asked for music to relax and “zone out” while he receives chemo. Kramer added the radiology department always purchases a supermarket gift card as well. In December 2014, Judith Mitchell, a mother of five was receiving radiation at the center to treat her breast cancer, and she needed help. She knew she would have trouble affording gifts such as clothes and shoes for her holiday presents for her children. Mitchell was asked by cancer center staff if she wanted to participate in the program. Business owners in the community also get involved. 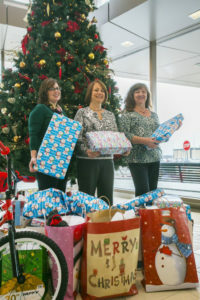 She participated in the program with her employees last year, and also helped her daughter’s fourth-grade class at Setauket Elementary School adopt a family. Teacher Eric Gustafson said it was a great opportunity to remind his students of the importance of giving — not just receiving. He remembered the children excitedly telling each other about gifts they picked out while they all wrapped the presents together. Gustafson encouraged other classrooms to participate, and Kramer added churches and other groups should consider it as well. 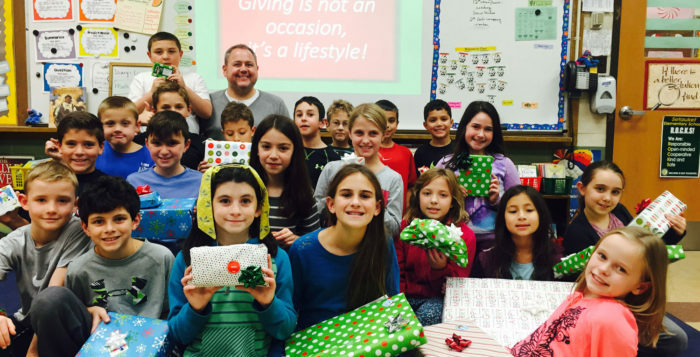 Students in teacher Eric Gustafson’s fourth-grade class at Setauket Elementary School hold wrapped gifts to be donated. Photo from Three Village school district.